Category Archives for "Puppy Training"
Did you just get a puppy? Or do you need help house training or potty training your puppy? 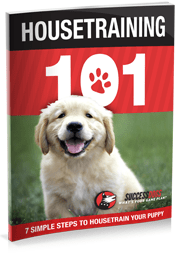 We’ve just released our new Housetraining 101 eBook that will guide you through the 7 simple steps to easily housetrain your puppy. These are the same 7 simple steps that we use here at Success Dogs to housetrain our own puppies, so we can vouch for its effectiveness. Step #1: Rewarding the good choice – Since your puppy has literally no idea what you want, you will need to use rewards as a way of communicating where you want your puppy to eliminate. Step #2: Catching your puppy in the act – Did you know that your puppy only learns in the present moment? By catching your puppy in the act, you’ll be teaching him that eliminating inside your home is not something you want. Step #3: Supervision is key – How do you prevent your puppy from eliminating inside your home when you leave for work? You’ll find the answer in this chapter. Step #4: Look for signs that your puppy has to go – Puppies will always give out signals that they need to go eliminate. Your job as a pet parent is to become aware of these and avoid accidents inside your home. 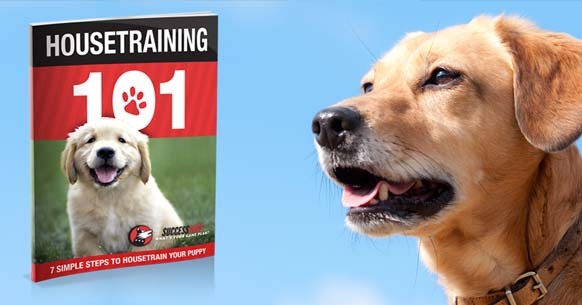 Step #5: Building a pattern – The objective of the previous four steps is to teach your puppy that eliminating outside will bring lots of joy, while eliminating inside produces nothing. This becomes a no-brainer for your puppy. Step #6: Asking for the door – Wouldn’t it be nice if your puppy asked for the door to go outside and eliminate? We’ll show you how to teach this important skill. Step #7: Conditioning a cue – Did you know that you can train your puppy to eliminate on command? This is extremely useful, especially when you’re going to the groomer, at an agility trial, or just in a rush. Why is this eBook free? Because when my family got our first dog, we had no idea how to housetrain him… And we ended up listening to other people’s incorrect advice, which only led to our dog loosing trust in us. I don’t want this to happen to your or to your puppy, I want more for you. In fact, I want you to begin training your puppy using positive, reward-based and force-free methods. Which is what’s inside this short eBook. 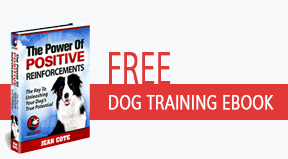 Feel free to share this free house training eBook with your dog loving friends. The more we spread the word about positive, reward-based and force-free methods, the happier dogs will become!